I tried to install my product with a wireless connection on my Mac, but the installation failed. What should I do? Press the home button, if necessary. Press the arrow buttons to select Setup, then press OK. Press the arrow buttons to select Restore Default Settings, then press OK. Press the arrow buttons to select Wi-Fi Settings, then press OK. Press OK again to reset the selected setting. Important: You'll need to know your network name (SSID) and network password before you can set up your product. If you don't know them, contact the manufacturer of your router or the person who set up your network. If you are using a 5 GHz wireless router, set the router to operate in dual band (2.4 GHz and 5 GHz) mode. See your router documentation for instructions. Note: Make a note of the file name and save the location so you can easily retrieve it. Open the file you downloaded, and follow the on-screen instructions. 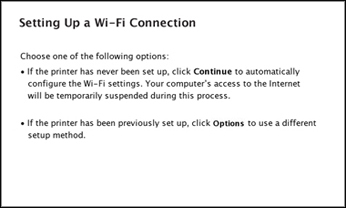 When you see the Select Your Connection screen, select Wireless connection, click Continue, then follow the instructions on your computer screen. 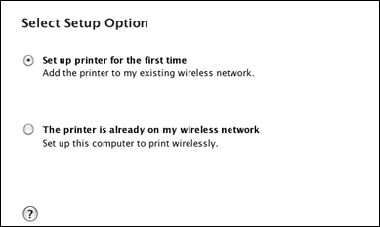 When you see the Select Setup Option screen, select Set up printer for the first time, click Continue, then follow the instructions on your computer screen to complete the installation. Note: We recommend using a temporary USB cable connection (cable not included) to simplify wireless setup. If you're using OS X 10.6, 10.7, 10.8, 10.9, or 10.10, or you don't have a USB cable, select Using printer buttons to set up your printer. 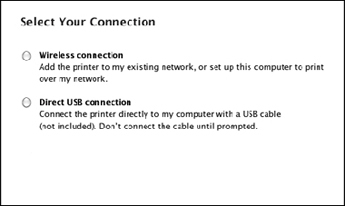 Follow the instructions on your computer screen during software installation; they will explain how to connect the printer wirelessly this way.